Monday February 25th 1895 It was rather a pleasant day. I got my morning work done and a nice dinner prepared. Charlie and Tishie came to spend the day. We had a good visit. Their baby is very nice. David sold a load of wood in town today. I read all the evening. 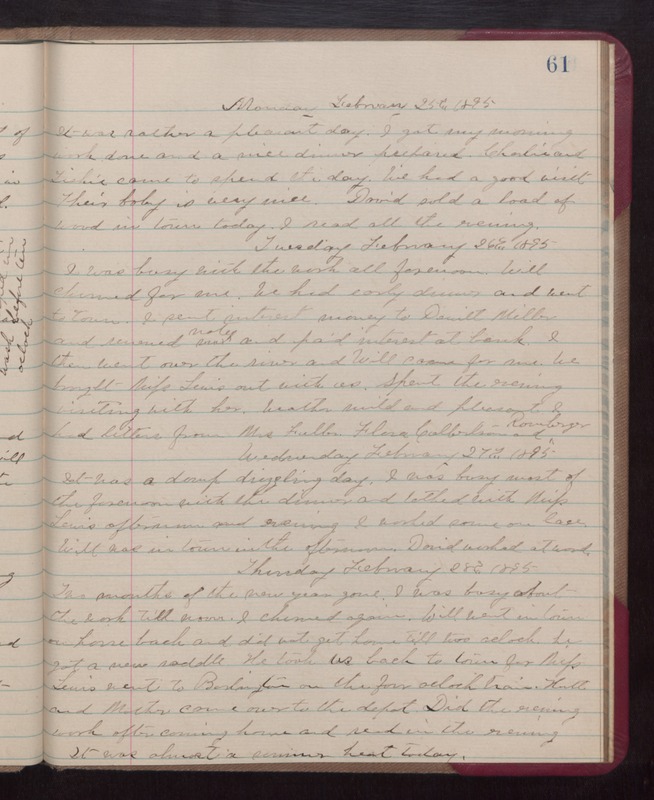 Tuesday February 26th 1895 I was busy with the work all forenoon. Will churned for me. We had early dinner and went to town. I sent interest money to Dewitt Miller and received note and paid interest at bank. I they went over the river and Will came for me. We brought Miss Lewis out with us. Spent the evening visiting with her. weather mild and pleasant. I had letters from Mrs Fuller, Flora Culbertson and Roweberger. Wednesday February 27th 1895 It was a damp drizzling day. I was busy most of the forenoon with the dinner and talked with Miss Lewis afternoon and evening. I worked some on lace Will was in town in the afternoon. David worked at wood. Thursday February 28th 1895 Two months of the new year gone. I was busy about the work till noon. I churned again. Will went in town on horseback and did not get home till two oclock. he got a new saddle. He took us back to town for Miss Lewis went to Burlington on the four oclock train. Hattie and Mother come over to the depot. Did the evening work after coming home and read in the evening. It was almost a summer heat today.